Where is this world going? I’ve done it; took the opportunity of a business trip to Jeddah to spend a free day here. I came once last year already, but for a 15-hour long working day. Now, finally, came the occasion to take the time and explore a little. Saudi Arabia doesn’t have the reputation to be female-friendly, as confirmed by the reaction of my two female collaborators last year, when I told them at the end of the day that I would go to a shopping mall to find a restaurant for dinner. “No, no, no” they shouted, one looking puzzled (a Syrian), the other properly terrified (a Saudi). They made me go back to my hotel and order room service. Was this a sort of North Korea for women? Was I going to be stranded in my room all weekend? View from Jeddah just before landing. I was flying from Dubai. No, no, no, I assure you. I’ve been absolutely fine. Partly because things are not as strict as we might think; partly because Jeddah is “liberal” by Saudi standards; partly because some of the rules and restrictions don’t apply to non Muslim women. I still can’t drive a car, although this will soon change, but I have been free to walk and move around (I’ved used Uber), enjoy a meal out, admire sights, and do some shopping. 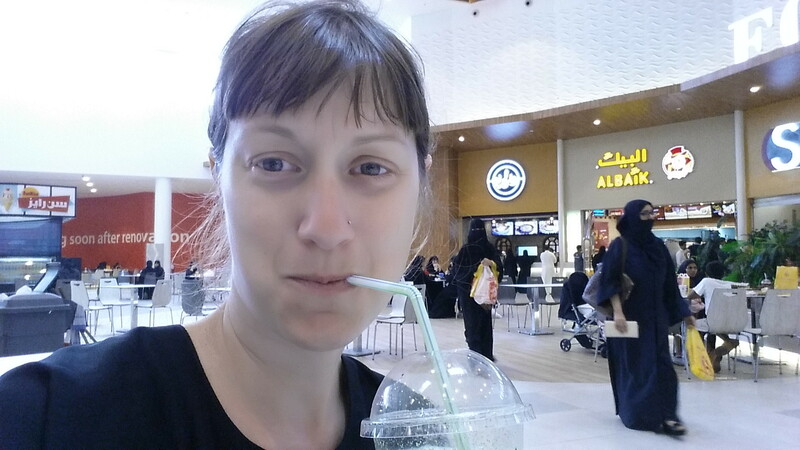 Having a melon and mint juice at a shopping mall’s food court. I didn’t have to be escorted from the airport by a male guardian, unlike what some websites still say, but instead found a taxi ride to my hotel, like the big girl that I am. I was often the only woman on the streets, except at the family-friendly areas of the corniche, but never received any unwanted attention. At the North Cornich by sunset. Can you see me? I stand between the two Ds! I thought oil had made Saudi a rich country. 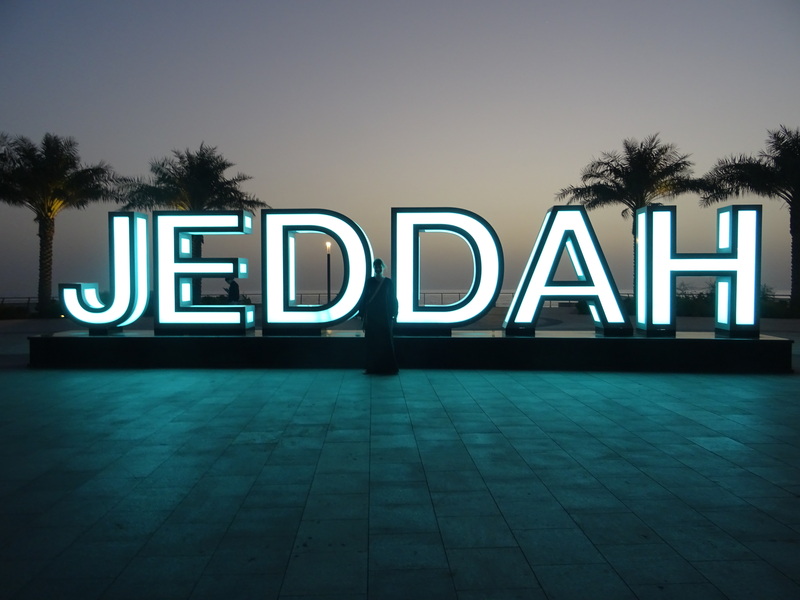 Surely, it has made some families rich – but the overall impression from Jeddah is rather that of an emerging city, like one could see in India or Egypt. 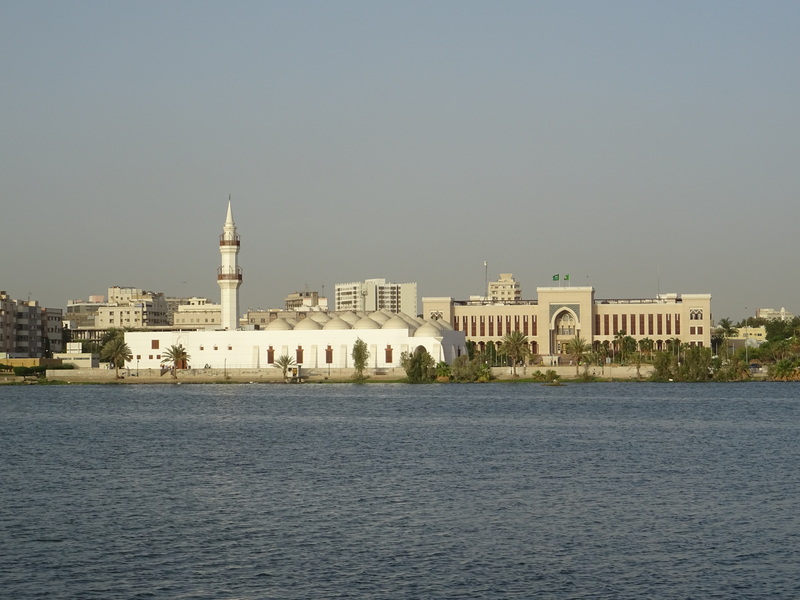 Views of Jaffali Mosque and the Ministry of Foreign Affairs, seen from across a lake. 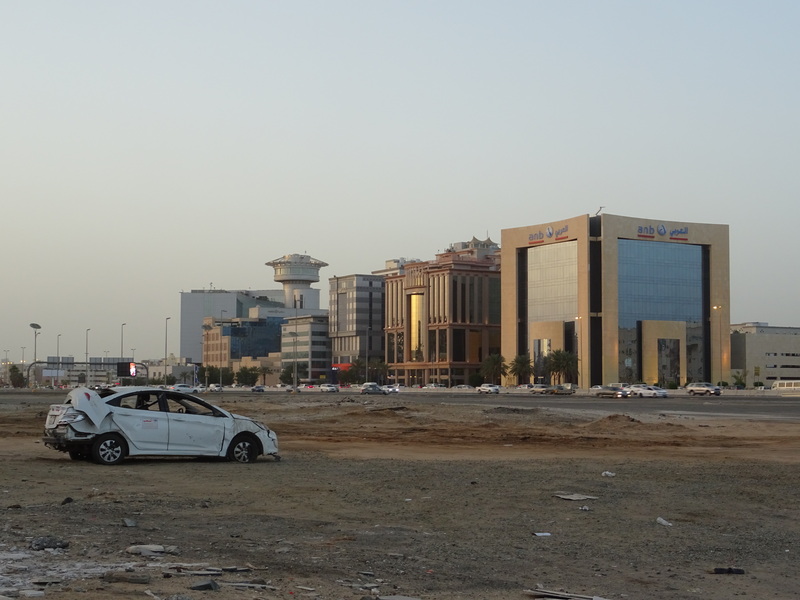 There are a lot of palaces and luxury shops in Jeddah, but also a lot of ruins, wastelands, and abandoned sites. I saw beggars, litter, and quite some misery on the streets. Traffic is dense and chaotic, accidents are common, cars are typically covered with dents. Jeddah is not a town for pedestrians. 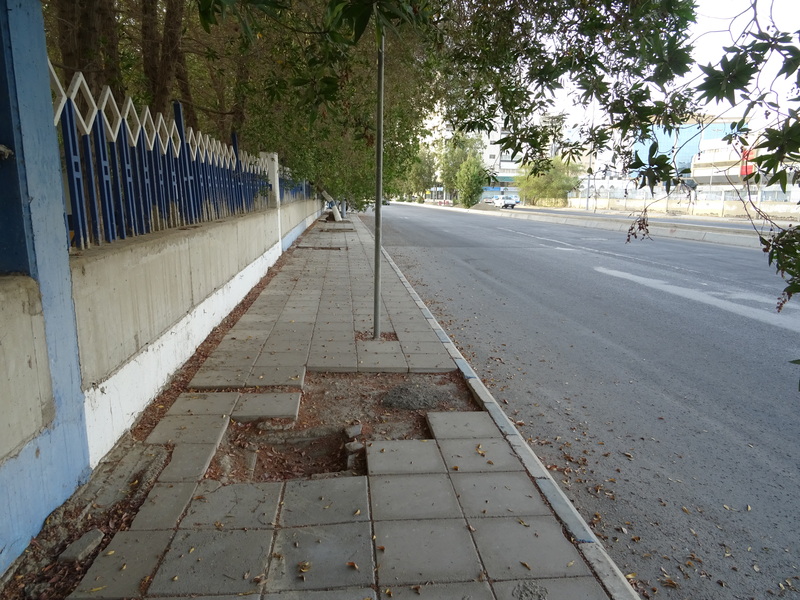 Sometimes there was a sidewalk, yay, but it was usually in a bad shape. Locals don’t seem to ever walk. 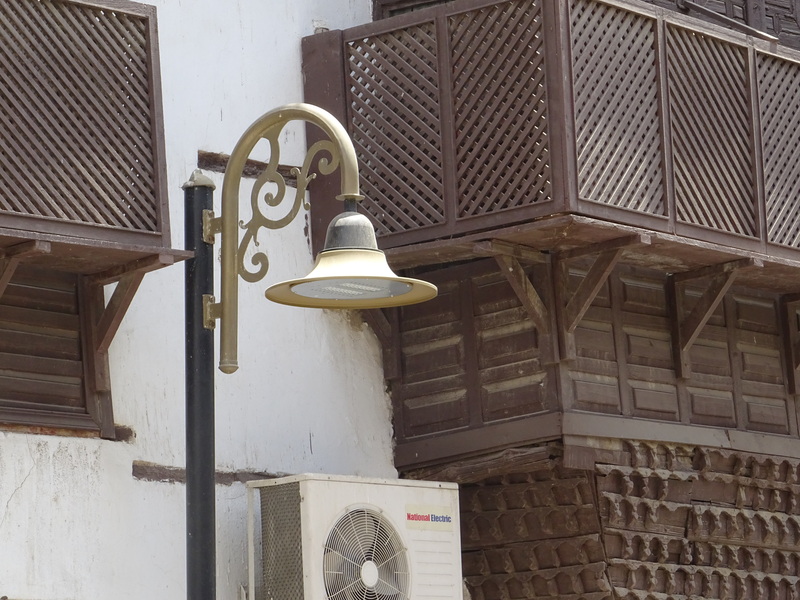 A common sight in Jeddah. The first thing you do when you arrive in Jeddah, is to check the prayers timetable. 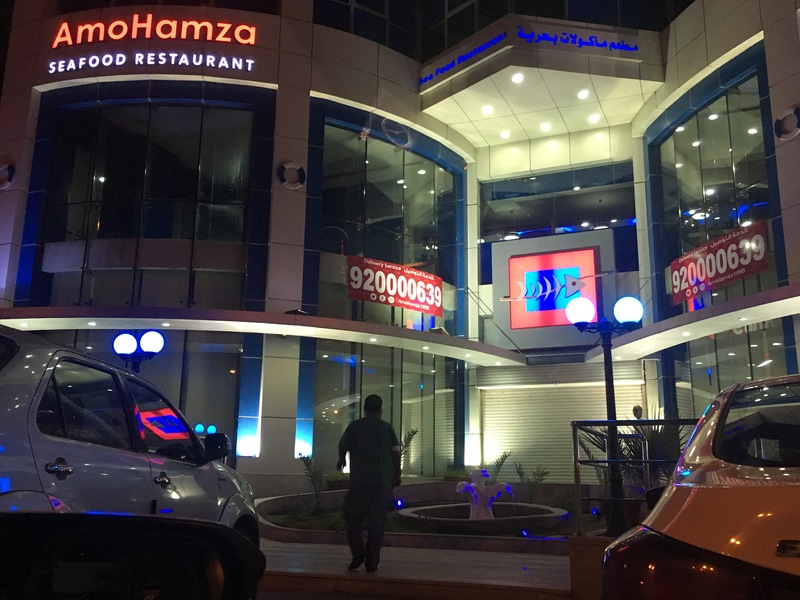 Shops and restaurants close during prayers, and that’s five times a day, so it’s better to know in advance what to expect. 8.20 pm, dinner time? No, prayer time! But there’s still some people inside, and as soon as prayer time is finished, it re-opens. What’s good to know is that some restaurants actually have a back door for families (and as a woman, that’s where you belong) and they can let you in. You still have to wait until the end of prayer time to order food, but at least you don’t have to wait outside in the heat! That being said, not all shops stop during prayer. Cars still drive, strollers stil walk; life keeps going. 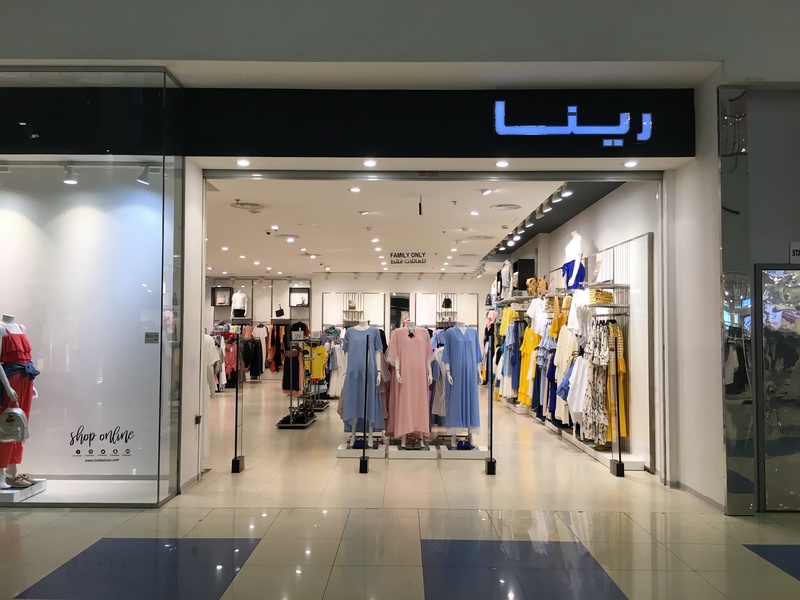 What to wear as a female in Saudi? First, imagine it’s very hot. With almost 40 degrees Celsius at this time of the year (that’s over 100 in Fahrenheit), I prefer a fluid and light dress, but I still suffer from the heat. But it doesn’t matter anyway, because you have to cover it all with an abaya. The abaya is a long, dark robe with long sleeves that goes down until the floor (and sweeps all the dust, yes), and I have never seen a woman in Saudi not wear it, apart from Michelle Obama on pictures. 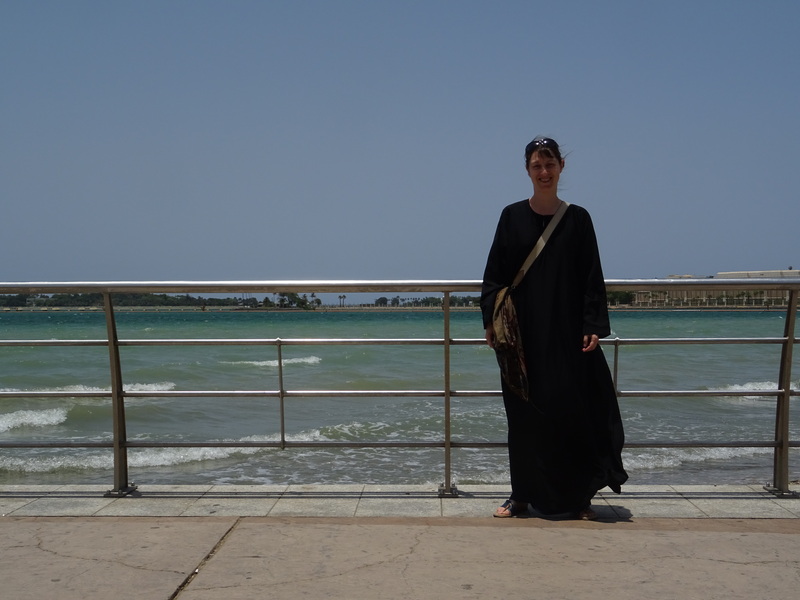 This is me, in my abaya, on the Jeddah corniche. I bought it before I came, in a souq in Abu Dhabi. 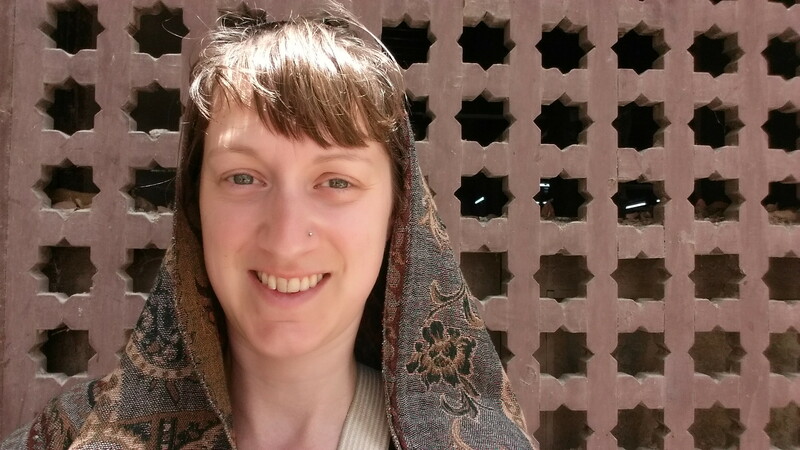 There is no obligation for non Muslim women to cover their heads however, and, unlike when I travelled in Iran where I had to be covered, this time I enjoyed the refreshing feel of the wind in my neck. If you see me with a headscarf on some pictures, it’s nothing religious, it’s rather to protect my head from the sun. Ah, the Arab hospitality; overwhelming by Western standards, and yet so delighfully cheerful. It started at the airport already. Seeing that I am French, the immigration officer said a few warm words in my native language. Searching for my visa, he spotted that I’ve been in Russia and also spoke some Russian. 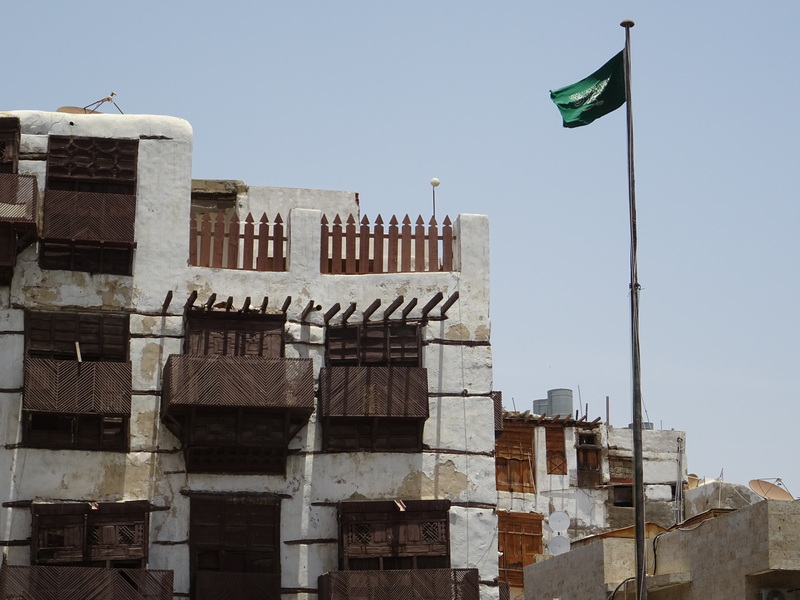 Once my passport was stamped, he gave me a large smile and said “Welcome in Saudi Arabia”. Many more people have greeted me this past day. Regularly, someone comes my way and says “Welcome”. Those amongst the Uber drivers who speak some English wished me to enjoy my stay; one even called me “sister”. 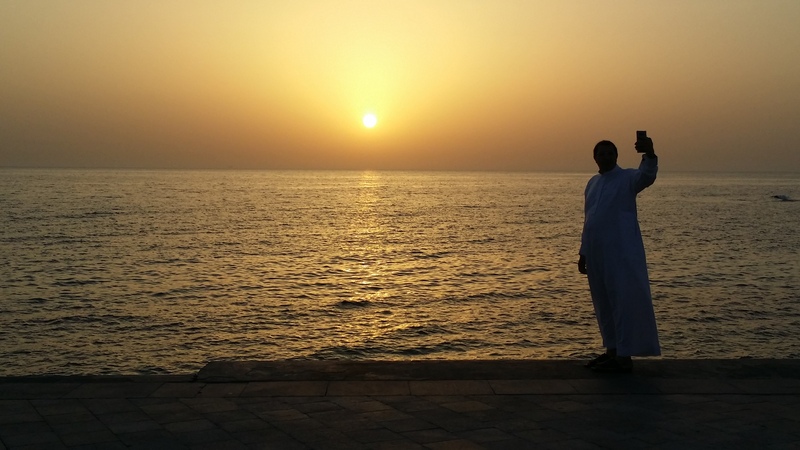 Local man taking selfie on the corniche. The Arab hospitality primary rule is to take care of guests. Even a policeman did it: seeing that I was struggling to cross a busy road, he simply stopped the cars to let me go. The Arab hospitality is also wat Muhammad demonstrated, a friendly Yemeni (although born and raised in Saudi) whom I met Saturday afternoon and insisted to take care of me, driving and showing me around, and even buying me a meal and ice cream. Well educated, speaking perfect English, Muhammad is a soft and warm man who dreams to move out to the West (which isn’t easy with a passport from Yemen) and claims he prefers the company of Westerners than Arabs. 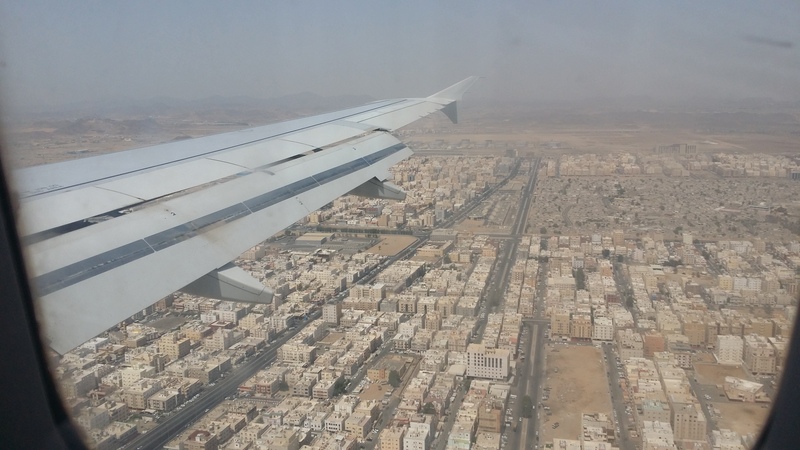 From our conversations, I learned a lot of insightful details about daily life in Saudi, and people’s struggles and aspirations, which made my stay so much richer. 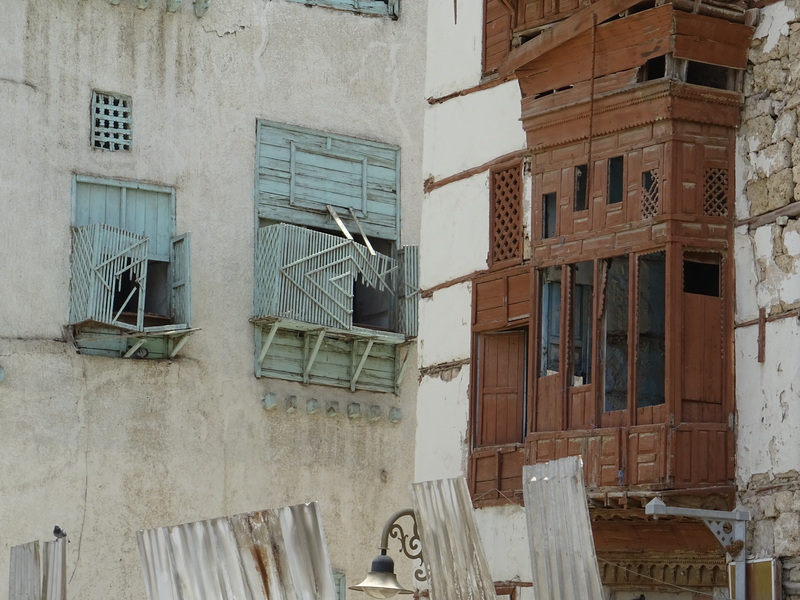 Jeddah has a few sights that guidebooks can tell you about, and a newly renovated North corniche that’s pedestrian and family friendly, but my favourite place has been the old district of Al-Balad, so full of Oriental charm. Alas, with the exception of a few restaured houses, the neighbourhood is not in a good shape, with many decrepit facades and unsanitary ruins. The renovated houses are beautiful. 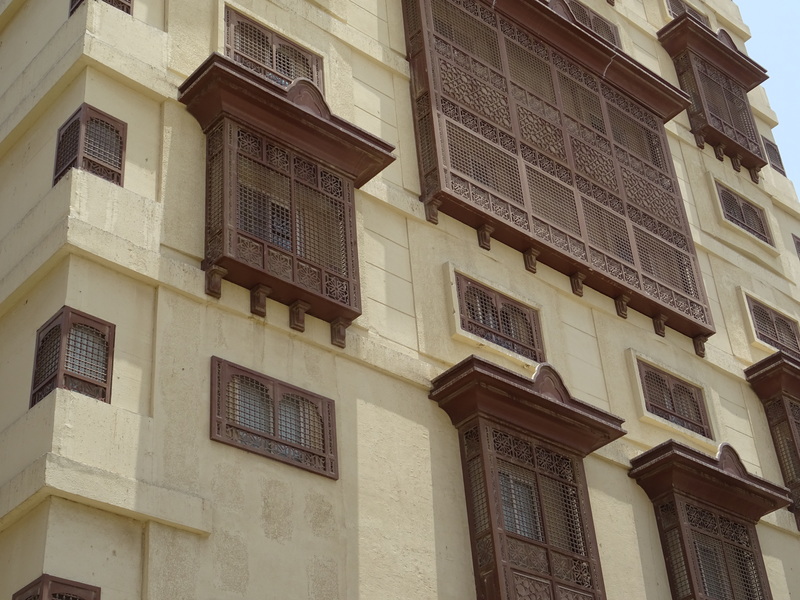 You can see the mashrabiyas, key element of traditional Arabic architecture. 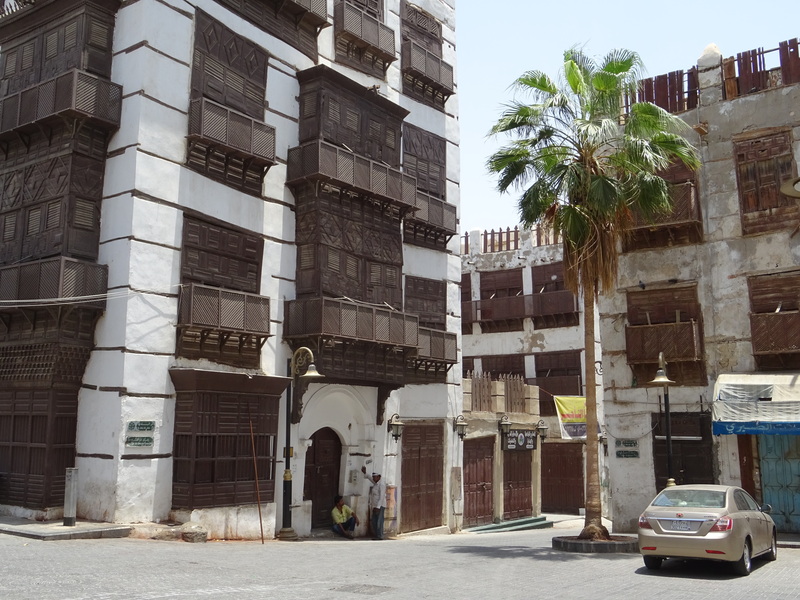 Saudis, please don’t demolish them! They are your heart and your soul. And plus, they’re the authenticity we seek when travelling in your country. But I guess Saudis prefer to build new stuff elsewhere, and abandon the old, rather than renovate it. 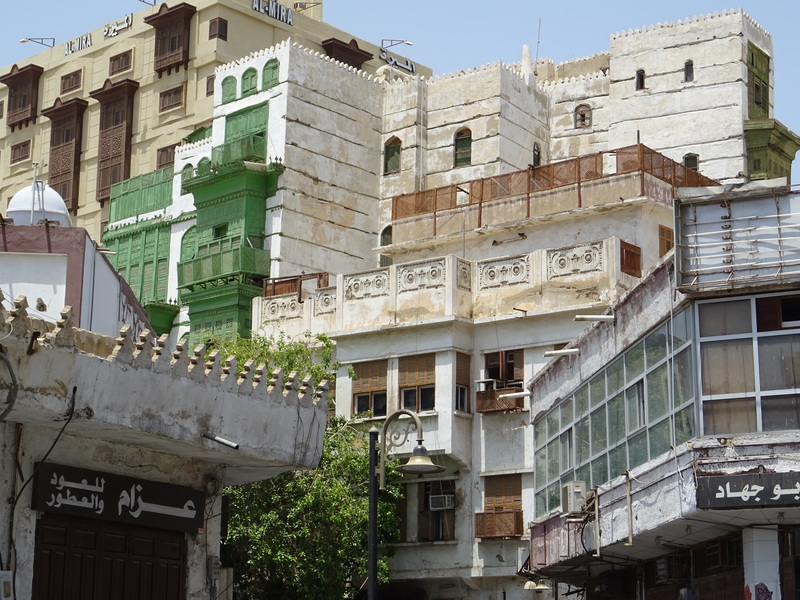 Luckily, some of Al-Balad is still there, and I enjoyed a lot to aimlessly stroll amongst the narrow streets filled with smells of cardamom and patchouli. Not a travel destination you get to read about all that often, so this was really great to come across. Thanks for the post & thanks for sharing some photos. Hi there! I have featured this as a guest post like we discussed (I had to move my Lost in Riyadh blog around a bit). I have embedded one of your photos for a featured image. Hope that is okay with you. Keep up the great work! i’ve been in jeddah for 31 years and i thought i will never see a woman driving in here but two days ago the ban was lifted and women are driving now :-), slowly but surely changes are coming for women in particular. love your photos! good blogging for a 24 hrs stay! My travels emitted 22.6 tonnes of CO2 in 2018. And yours? Happy Easter! Here’s a Lenin statue disguised as Easter bunny.